The Licking County Historic Jail, built in 1889, is Licking County’s fourth jail. When it was constructed, the jail was lauded as the best and sturdiest jail the state had ever seen. Its stone, Millersburg brownstone, was quarried and transported from Millersburg, Ohio. Well-known Ohio architect Joseph Warren Yost designed the structure in the Richardson Romanesque style. J.W. Yost is responsible for buildings such as Orton Hall on the Ohio State University campus, as well as numerous local government buildings. Yost included several unique architectural details in the design, such as cat-like creatures sculpted into window sills and an open-mouthed frog water spout. The building has many other features that are typical of Richardson Romanesque architecture, such as arches and turrets. Overall, it is one of Licking County’s most architecturally significant buildings. When one walks into the front door of the Licking County Historic Jail, they are walking into what used to be the Sheriff’s foyer. Although a practice unheard of today, the three floors in the front of the building were originally intended to be living space for the Sheriff’s family and a matron. The first floor consisted of the foyer, living room, dining room, family kitchen, and an office. The second floor had bedrooms for the Sheriff’s family, and the third floor was the living area for the Matron. By the 1970s, these spaces were no longer used as living quarters and were instead transformed into offices and work areas for the staff of the Sheriff’s Office. This lead to many of the building’s original ornate details to be painted over or removed. Throughout its lifetime, the jail saw many tragic deaths including suicides, murders, and accidental deaths. Four sheriffs suffered heart attacks in the sheriff’s living quarters; there were numerous suicides such as those of Mae Varner and the infamous Walter Robertson; and there is the well-known tragic tale of Carl Etherington, who was lynched during the days of the Temperance Movement. When first built, the jail was able to hold up to about 68 inmates. One floor held women and the other three held men. However, by the 1970s women were moved outside of the county to accommodate for the increase in adult male inmates. This overcrowding, combined with updated state standards for housing inmates, was slowly making the historic jail an uninhabitable environment. By 1981, when the tenure of Sheriff Gerry D. Billy began, plans were in the making for a new jail that adhered to the necessary state standards. Finally, in 1987, the Licking County Historic Jail officially closed its doors. For years the jail sat empty. It briefly housed the county’s Veteran’s Service Commission, but for many years housed hundreds of boxes of county records from various offices. In 2012, a renewed interest in the jail sparked the motivation needed to begin cleaning the building. With the assistance of the Records & Archives Department and many volunteers, the building was cleaned out and open for tours that year. Through the ongoing efforts of the Licking County Governmental Preservation Society’s Archival team, the collection of historical documents, artifacts and memories are actively being collected, cataloged and preserved. Our hope is to have an environment where the communities at home and at large will be able to interact with these collections and gain a further understanding of life in the 19th century as it relates to the Licking County Historic Jail. If you are interested in contributing to the archival effort, please contact us. 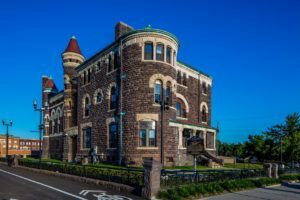 Listen in as the history of one of the most historic locations in Licking County is revealed through local residents with a real life connection to the Licking County Historic Jail. You can listen to some oral histories of the jail, courtesy of the Licking County Records & Archives Licking County Historic Jail Oral History Project.